It's finally that time of the year again... time to buy your Bean Boots for winter before they sell out. And trust me, they will sell out. Don't be one of those people who order theirs during the first snowfall and have to wait until summer to get them in (not joking, this has happened the past two years). Don't believe me? 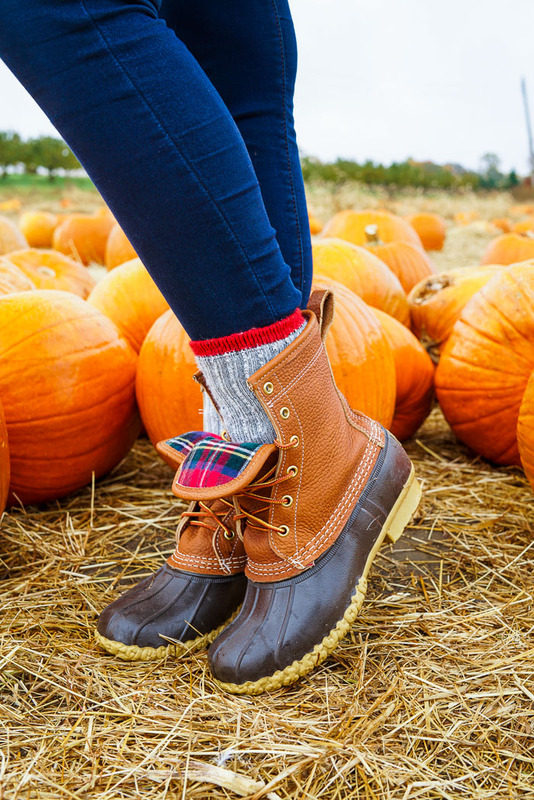 Google LL Bean Boots backorder and see the thousands of articles trying to explain why. It's amazing. And if you are smart, you will buy them S-O-O-N and thank me come winter. 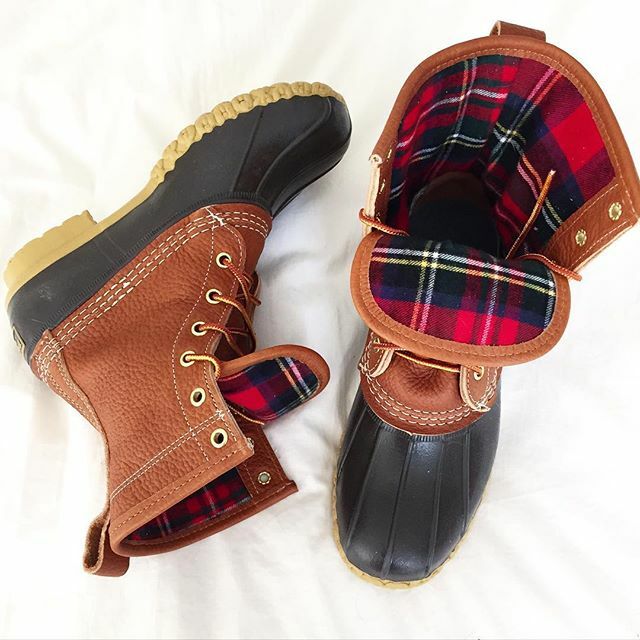 LL Bean Boots are notorious for running full size large because they are handmade. I have been a size 8 my entire life in every shoe and for Bean Boots, I'm a size 7. Even Andrew had to go a size down in these! They don't do half sizing (not that I would even need a 7 1/2) so that's why people generally size a full size down. 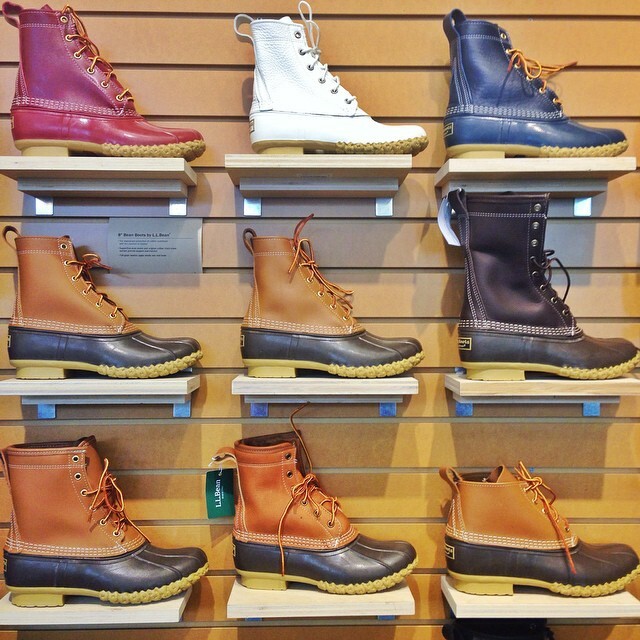 If for some reason you don't want to listen to my advice, LL Bean has your back and it's very easy to exchange your shoes out for another pair! As for the Wide/Narrow/Medium sizing, I wear a 7 Medium, which is really just a regular width shoe. If you have extra narrow or extra wide feet and normally purchase your shoes this way, follow the same suit and continue to buy for your feet. I'm fortunate enough to own two pairs of LL Bean Boots! My first pair are the 8" navy and tan and my second (that I got last year -- they were limited edition) are an 8" brown and tan pair with plaid lining. I'm happy to have both colors so I can switch it up depending on the outfit but you really cannot go wrong either way. I love the navy and tan because I wear a ton of navy and I just love blue. But a lot of my friends prefer the brow and tan because it is more classic. I think if you can get your hands on any Bean Boot, they are an instant classic. LL Bean has also come out with an all blue and pink pair as well as an all blue and green pair if you're interested in more colors! For height I love my 8" pair. While they *may* be a little harder to get into, I can jump in slush puddles all day long and not worry about getting wet. 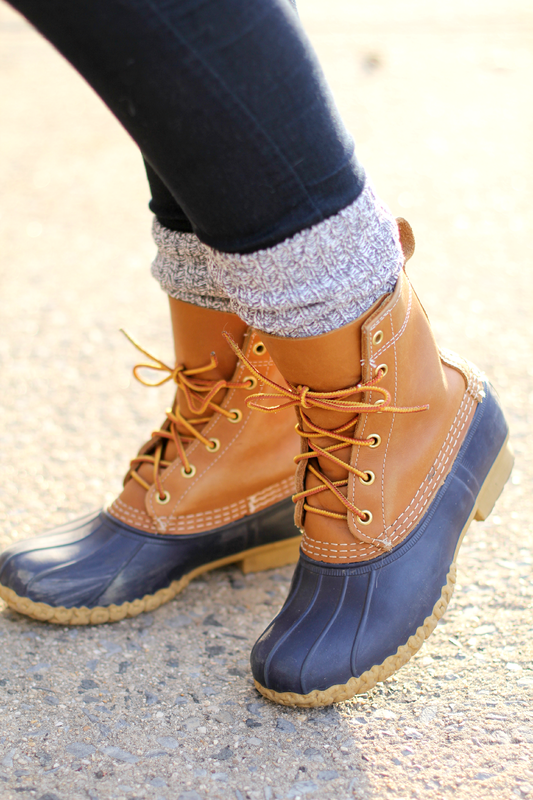 I very much use my bean boots in the snow and winter so for me, the 8" pair made sense! I may be one of the very few people who don't suggest buying the boot lining -- the shearling or the Thinsulate. I remember Andrew going back and forth on this when he was buying his pair and my reasoning is this: they are no doubt great (like very great) for winter and the cold weather days. But what about when you go inside? What about the warmer days when it rains and it's not snowing? What about during summer when you need a durable rain boot? Buying the boots with any kind of lining, I feel, makes them harder to wear year round. These boots are not only great for winter but fall, spring and summer too. Don't limit their possibilities because of the lining! Plus there is nothing worse than wearing really warm shoes indoors when you're starting to defrost. With all of that said, the regular Bean Boots are in no way warm by themselves. What I do is I wear thick wool socks, camping socks or liner with the boots! It helps keep my feet warm (without overheating) and also makes styling the boot much more fun! I get asked all the time if these shoes are comfortable. While we all base comfort on different things, I base my rating on if I can walk in them all day long without my feet hurting. Simple answer: yes. Yes. Yes. Yes. But are they durable? Let's see... I've had my bean boots since college and have worn them through London, Chicago, Maine and New York City winters, rain showers and major puddles and they look barely beaten up. So yes, they are durable. They are so durable that I can still stand in a 7" puddle (up to my ankles) and no water will ever touch my feet. That to me is impressive. And IF by some magical chance they aren't durable up to your standards or there is something wrong with them, LL Bean will fix or replace them for free! They have this quality guaranteed for life (!!!!) policy so you know you can buy them without fear. 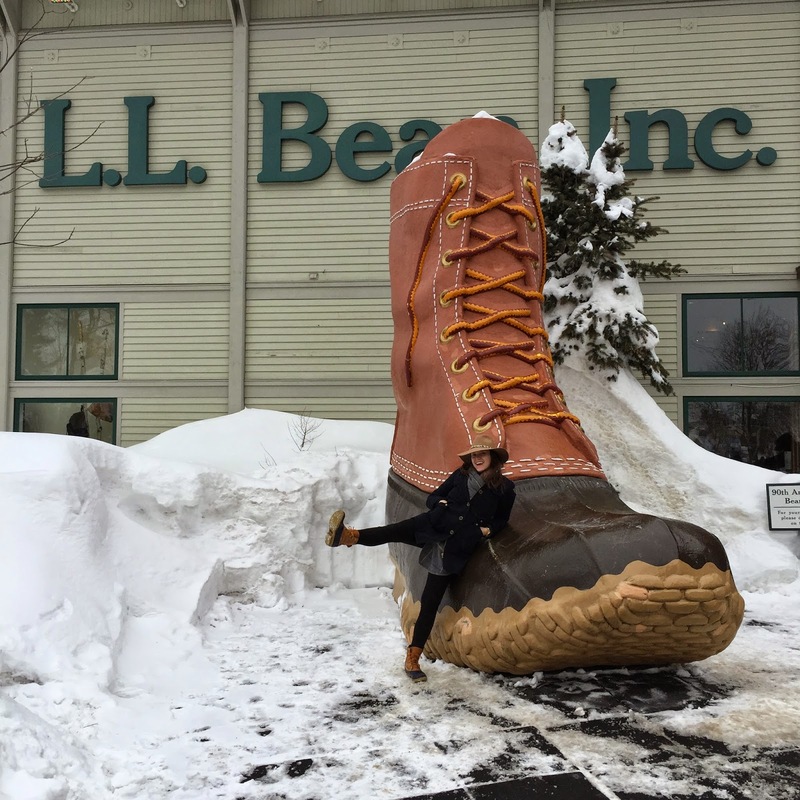 You can read last year's Q&A on Bean Boots HERE! Any more questions on LL Bean Boots? Leave them below! I 100% agree! I have the shearling insoles and they've made my boots considerably warmer when needed and I always recommend them. They are men's sizes, so while my boots are a 7, my insoles are a 6. I got them for just $10 with coupons a couple of years ago! I'm OBSESSED with my Bean Boots they're lifesavers in the winter! Your tips are perfect for someone looking to buy their first pair! I just got a pair for my birthday! So excited! I love my Bean Boots! 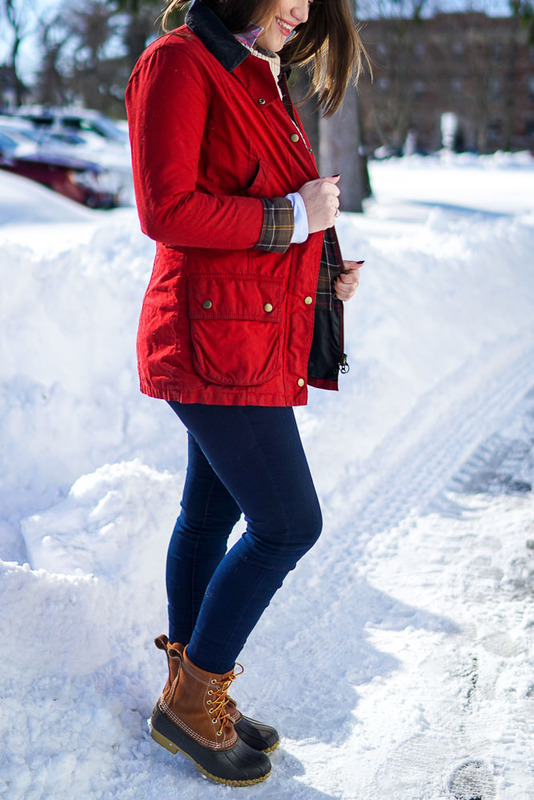 I have a pair in solid navy that I bought a couple of years ago, which was perfect timing as it was right before the Boston area got hit by that horrible winter; I wore them probably every day for six weeks straight...a definite lifesaver! I borrow my Mom's Bean Boots that she purchased over 25 years ago. They look the exact same as they did when she bought them!! - Except she calls them Duck Boots. I'm so excited, I just ordered my first pair! I've always been on the fence about getting some but you have absolutely convinced me with all of your reviews and advice!! 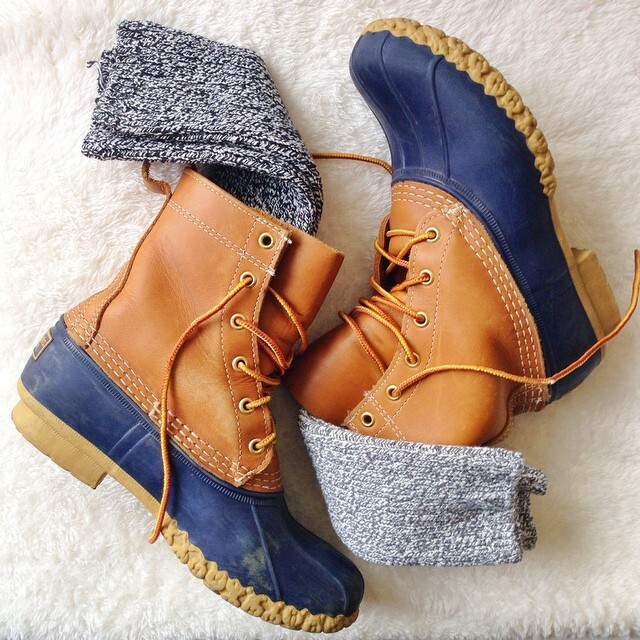 I've had my eye on a pair of Bean Boots for a while. This was definitely helpful! Do you have any tips on breaking them in? I got my first pair last year when I moved to nyc but they're still so stiff that I never want to wear them enough to break them in. Good advice about the linings. I've been contemplating getting a second pair but with the thinsulate, but I like your reasons for not. Awesome post!